The particular characteristic of these steels is their high carbon content, which gives the tools a high level of hardness. to be concentrated. in those sectors in which wear, impact and shear stresses are present. Their main characteristics are toughness, wear resistance and hardenability. The hardness of steels for cold work varies from 52 to 63 HRC, whilst the hardness for hot-work steels ranges from 36 Selection of the most suitable type of steel for a specific purpose is not easy and it should be carried out after accurate appraisals. Great care should be taken with heat treatments, since these steels fail easily and, if the high cost of the raw material is extent of the damage resulting from incorrect hardening and tempering can be easily appreciated. Pre-heating is recommended for these steels with thermal rates of not more than 50 °C/hour and pause for homogenization before reaching the forging and quenching temperatures. Some suggestions for the production of dies. When the work surface of the tools is near the axis, it is worthwhile upset material, or material with upside-down fibres. 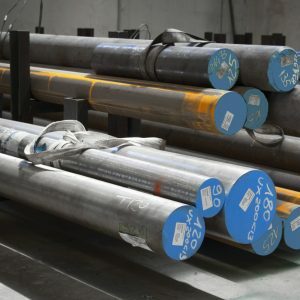 For cold-working steels, at least one phase of stress relieving is recommended before quenching, which must be immediately followed by tempering when the material is still at temperature of approximately 150°C. Moreover, after tempering, cooling must be slow, to prevent both internal and external stresses.